During its remarkable, and remarkably consistent, lengthy run, It's Always Sunny in Philadelphia has brought viewers the dark and hilarious adventures of "the gang," a group of Philly-based misanthropes and selfish fools who hang out in Paddy's Pub, their crumbling workplace. Mac (Rob McElhenney), Charlie (Charlie Day), Dennis (Glenn Howerton), Dee (Kaitlyn Olson), and Frank (Danny DeVito) never learn the typical sitcom lessons as they slowly and amusingly make the world (and their own lives) a worse place. It's a show that some have aptly described as "Seinfeld on crack." It's Always Sunny's chief creative team also happens to be the stars — McElhenney created the show, and Day and Howerton helped develop it. It's an intimate, DIY affair, which makes for a very loose set prone to improvisation… and where everybody makes one another laugh. Here are some of the funniest bloopers ever captured during the filming of It's Always Sunny in Philadelphia. In season 10, the gang undertook one of its most notorious — and potentially dangerous — activities to date: attempting to match baseball Hall of Famer Wade Boggs' supposed off-the-field "record." According to lore, he once drank 70 beers during a cross-country flight. Out of the five characters, only Dee and Charlie make it all the way to 70 by the time their plane lands in Los Angeles, but not without some consequences: Sweet Dee passes out during the flight, but rallies, drinks some more, and then passes out again on the baggage carousel. Also, drinking 70 beers is going to make even the most experienced beer fan a little gassy. In this bit, Olson chugs a beer and quips, "That one hurt," and then tries to belch out the excess air in her stomach. Amusingly, she's just "stage burping" at first — faking it — but then her body conjures up some actual burps, the smell of which disgusts her co-star (and real-life husband) Rob McElhenney. The real culprit, according to Olson: "Pulled pork." In this scene from Always Sunny, two long-running plot threads converge. The first: Dennis Reynolds is most likely a psychopath, prone as he is to fits of rage. The other through-line: The gang is frequently loudly and angrily dismissive of "Sweet" Dee Reynolds, the most reasonable person in their midst. Dennis and Dee are twins, and yet nobody yells at Dee with as much ferocity and venom as Dennis. In this bit, he rants about as darkly as he's ever ranted, so offended by some minor slight that he threatens to dice his sister into tiny pieces and then place those pieces into a box, which he will then put into a freezer for some reason. It's so extreme and so over the top for a person to behave this way and say such things that neither Howerton nor Olson can keep their composure through ridiculous take after ridiculous take. Dennis Reynolds has "been" with many women over the course of It's Always Sunny, using mind games and his "D.E.N.N.I.S. System" to trick young ladies into going to bed with him. But even for a monster like that, there's "the one who got away," and for Dennis it's his dream woman, Jackie Denardo (Jessica Collins), a local news reporter that Dennis is too tongue-tied to approach in a chaotic big-box store when she's covering a coming super-storm. Jackie makes a later appearance in a fantasy sequence, when Dennis imagines how he'd ideally handle a convenience store robbery the gang encounters. According to his twisted mind, he'd get injured and Jackie would quit her TV job to nurse him back to health, complete with a skimpy outfit. This blooper is from the filming of that sequence, wherein Collins tries to feed Howerton some sloppy mush, but he's laughing too hard for any of it to actually go into his mouth. The Paddy's Pub crew has tried a lot of get-rich-quick schemes, from "Kitten Mittens" (to silence cats' pawing) to towels designed to prevent drying off the face with the same part of the towel that dried the crotch. But none are as silly and enduring as Fight Milk. Charlie and Mac concocted it, an "alcoholic, dairy-based protein drink for bodyguards by bodyguards." According to Charlie, it also, oddly, gives consumers the strength of a crow. Mac and Charlie try to interest investors, business people, and regular folks in Fight Milk the way the gang usually promotes a product: with a terrible, homemade commercial. These outtakes are from that ill-fated shoot as Mac and Charlie tout the benefits of their disgusting and alarming product. McElhenney and Day try to sync up their aggressive sales tactics and macho posturing, shirtsleeves pulled up to reveal their Fight Milk-fueled muscles, but they just keep laughing at one another. In the seventh season of It's Always Sunny, Mac puts on a large amount of weight. Forever obsessed with physical fitness, he proclaims that he's "cultivating mass," conflating adding flabby pounds to his body with getting muscular. As a result, Mac spends a lot of his time eating junk food, particularly in his down time, like when he and Charlie are hanging out in a van during a stakeout mission. The two stopped for burgers on the way, as well as chips — Mac got chips but Charlie didn't, and now, after the fact, Charlie just wants to snag one. But Mac will have none of that, angrily exploding at Charlie (through a mouthful of food) for trying to horn in on even a bite of his precious empty calories. The exchange makes Day laugh, which prompts McElhenney to keep angrily riffing, which just makes Day laugh even harder, and that makes McElhenney crack up, too. It's all a vicious cycle of chip lust and laughs. One of the most popular recurring characters on It's Always Sunny is Matthew Mara (David Hornsby), a former high school classmate of the gang they nicknamed "Rickety Cricket" due to his creaky leg braces. He went on to become a priest, but when his longtime crush Dee tells him she loves him, he quits — but by then Dee isn't interested (of course), sending him into a downward spiral of harrowing homelessness along with drug addiction, injuries, disfigurement, and constant humiliation. This blooper comes from a scene in which Cricket tries to point out one of the little-known hazards of life on the street to Dennis and Sweet Dee. He explains that there are feral dogs out there, and that to survive, one must get inside the head of those puppers… and to also let one of them "do its business" to one's prone body, if necessary. That, along with Hornsby's guttural noises while he enjoys some hard-won food, are too much for Howerton and Olson to handle. Dennis Reynolds has proven himself to a be a violent, reckless person with a deep animosity for anything he perceives to be "below" his station in life, such as objects he associates with poor people, as he grew up wealthy and still acts entitled. In this clip from a fourth season episode, he and Charlie walk into a comfortably middle-class apartment… for which Dennis immediately shows disdain by sarcastically referring to it as "charming" and "quaint." Then, to emphasize his verbal eye-rolling, he picks up a vase belonging to the resident and throws it on the ground. It's supposed to break into a million pieces, but it just doesn't. Howerton tries several times, but he just can't get the thing to smash. It disarms both Howerton and Day as they grow ever more determined to break the surprisingly strong prop. But alas, as Day points out, "This is an unbreakable vase, dude!" 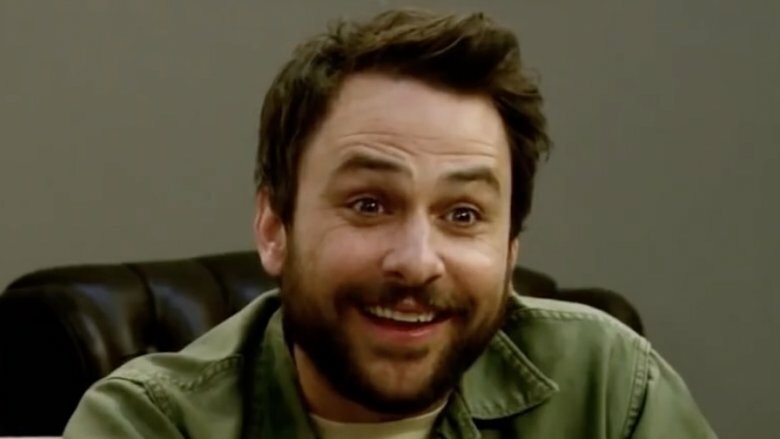 Charlie Kelly is one of the least bright characters in TV sitcom history, so intellectually challenged that his extreme illiteracy is a dark running joke. And yet he seems to have a real gift for the creative arts. In the fourth season of Sunny, he writes a stage musical called The Nightman Cometh, a fantasy about the fight between two mythical characters (The Nightman and the Dayman), which also alludes to childhood trauma, and which is also an elaborate ploy by Charlie to get his uninterested crush, "The Waitress" (Mary Elizabeth Ellis) to marry him. Charlie directs the play, and acts in it, so he needs an accompanist to play the piano. He hires a little old lady named Gladys (Mae LaBorde), who probably didn't know what she was getting into with this group of miscreants. Perhaps it's the absurdity of bringing such an innocent person into their weird little club, or maybe it's Gladys' boasting of both living through the Coolidge administration and being 99 years old (which was true of LaBorde), or maybe it's Day sniping at her. Whatever it is, Glenn Howerton and Rob McElhenney lose their cool. Mac was raised almost entirely by his silent, chain-smoking mother, seeing as how his father (Gregory Scott Cummins) spent Mac's whole life in prison. Mac has understandably got some daddy issues to work through, and in a second season It's Always Sunny episode, he tried to connect with his father by visiting him in the big house, trying to win his love by offering to do whatever he could. Dad's request: for Mac (and Charlie, along for the ride) to smuggle heroin into the prison for him. Mac tries to use the favor as a bargaining chip, while Charlie is enthusiastically all-in. He promises Mac's dad, Luther, that they will soon return to the prison with their… well, places where inmates uncomfortably and stereotypically put stuff they want to keep hidden… "so filled for you." Neither McElhenney nor Cummins can resist laughing at that particular promise. But they absolutely lose it when Day likens his soon-to-be-heroin-filled cavity to "a Christmas stocking." Charlie is a little slow, and a little bit of a wild card, so the gang has to work hard to rein him in and make sure he behaves correctly as he does "Charlie Work" (disgusting janitorial jobs around the bar that nobody else wants to do). Somehow, some way, he gets a date in one fifth season episode, and his friends/handlers provide lots of advice for the big night. For one, they specifically tell him not to eat any cheese, but Charlie can't help but eat cheese when he's nervous, and, well, being on a date makes him nervous. Mac and Dennis find a workaround, telling Charlie to just not breathe in the direction of his companion, but instead he gives them a whiff of his tremendously stinky cheese breath. It seems to actually be that bad in real life, as how McElhenney and Howerton are bowled over and are reduced to giggles after the wind hits them wrong.